The Yarborough monument was erected in 1849 by public subscription in memory of Charles Anderson Pelham, 2nd Earl of Yarborough. Lord Yarborough lived at Appuldurcombe House, Wroxall, which had been inherited by Henrietta, his wife, from her uncle, Sir Richard Worsley. In 1825 he has been appointed the first Commodore of the Royal Yacht Squadron at Cowes and during his time in that position, the popularity of yachting, and membership of the Squadron had grown. After his sudden death in 1846, the committee of the Squadron proposed a ‘Nautical Monument’ or ‘Sea Mark’ in his memory and contributed £200 towards the cost – the Yarborough Monument was the result. 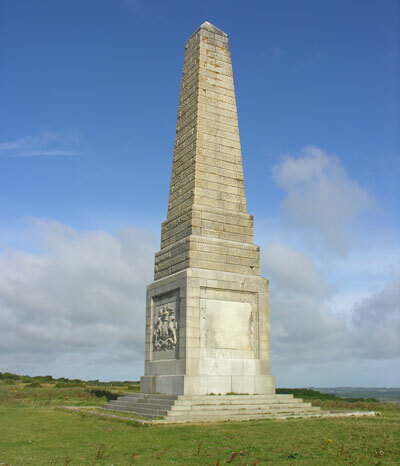 The monument had originally been erected further to the west on top of the Down but was moved to its current position in 1867 to make way for the Bembridge Down Fort which was part of Lord Palmerston’s defence system for the Solent.